Home / Holidays/Celebrations Art / Holiday Season Card Using Large Snowflake and Let it Snow! Holiday Season Card Using Large Snowflake and Let it Snow! “Snowflake, Lg.” was stamped on white card stock with a black Memories pad and colored with silver pencil. 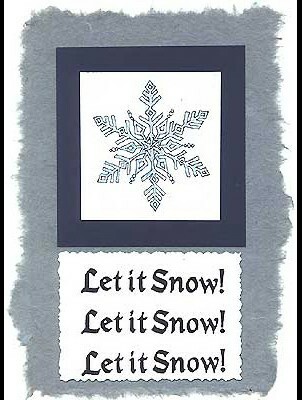 “Let it Snow!” was stamped in black three times on a deckle trimmed rectangle. The snowflake was glued to dark blue card stock and both were layered over gray mulberry paper and white card stock. Card by Mary Connaway who, also, drew the snowflake. Tags: Colored pencils, Decorative Scissors, Handmade Paper, Let it Snow!, Mary Connaway, Snowflake Lg.